Another trip from the archive. 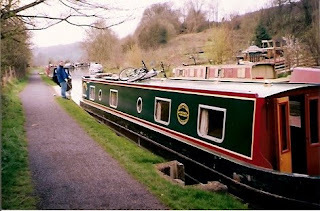 Belle was ferreting through some old prints and came across some of a four day trip in 2004, on the western end of the Kennet and Avon aboard ABC's Empress, part of their Hilperton fleet. 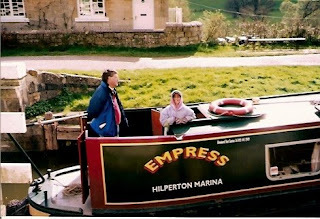 This trip was very significant in that it was our very first boating trip as a family. 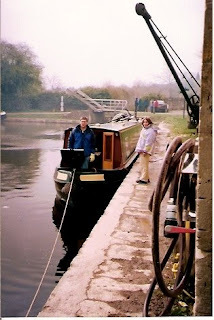 Some friends had used their Tesco's vouchers for a canal trip from Alvechurch on the Worcester Birmingham Canal and Belle suggested we could do the same. I seem to remember that the £400 of vouchers covered all but £50 of the cost of a four day hire, and we linked the boat trip to a visit to see some relatives in Trowbridge. 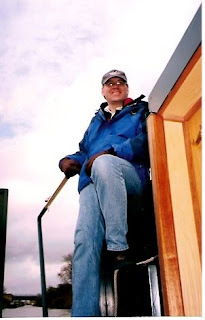 Belle captured my look if beatific euphoria as I took the tiller for the first time in nearly 20 years, and I think she realised that at that moment just how much boating meant to me. For me it was like an ex junkie taking a another fix. I was hooked all over again! We only had four days so we struck out westwards along the course of the Avon, meeting yet more family at Bradford on Avon lock and then on across firstly the Avoncliff Aqueduct, and on through the wooded section of Limpley Stoke and over Rennie's magnificent Dundas Aqueduct and the entrance to the Somersetshire Coal Canal (as it was called when built). 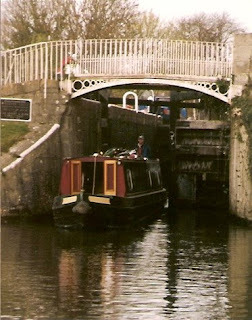 A feature of the canal was the huge number of unofficial and officious live aboard boaters who lined the route and made the passage very slow. If I had any sense I would have winded just beyond Cleveland Tunnel, but sadly I didn't and was obliged to descend the top three locks and wind between Bath Deep Lock and Wash House Lock, and then work back up again. Eight locks is a high price to pay for over shooting a winding hole! We moored above Bath Top lock and spent a very enjoyable afternoon wandering around this ancient city, followed by a family pizza in the evening. We retraced our steps and had a day to spare, so moved on beyond Trowbridge with a view to getting somewhere close to the foot of Caen Hill, which we had walked up during a previous visit to the area. To the west of Hilperton lies the new Semington aqueduct over the A350 Trowbridge to Chippenham Road, all bright and brash in fresh concrete. Its no Dundas but it is still impressive and provides an idea of how the M6 Toll Aqueduct will look when the Lichfield Canal is in water. In the event we made it past the bricked off entrance to the Wilts and Berks Canal (another basket case but now with real prospects of restoration) and on up the Semington and Seend Locks, finally winding between the two swing bridges near Sells Green. The section to the east of Trowbridge marks a change of scenery, with the canal breaking away from the Avon valley and starting to climb though the Wiltshire farmland. One day, I would like to get back to this area in our own boat ,but with Bath being three weeks cruising from Birmingham its a dream that will have to wait a while yet.